Living things provide tremendous opportunities for reenvisioning our homes and cities. Architects are exploring everything from new biodegradable materials created by microbes to incorporating novel organisms with new functions within structures. 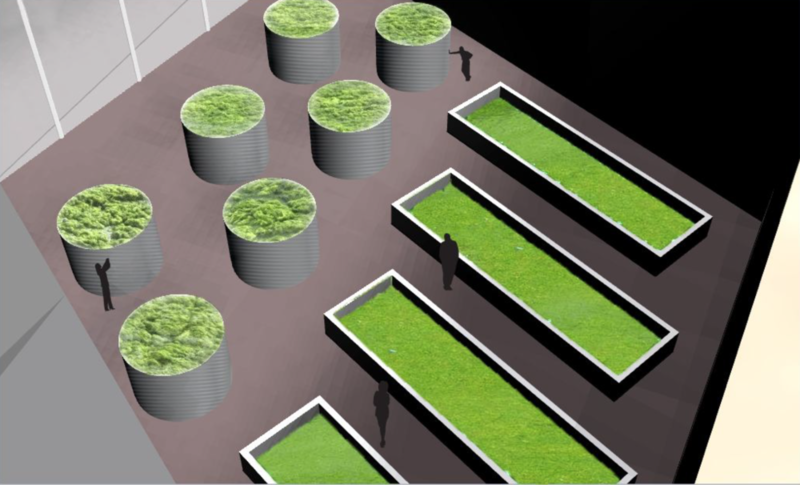 In 2015, the student design teams at NYU Gallatin will apply the theories of intelligent green design and biotechnology to homes and cities, both harnessing and being inspired by the structures in the natural world. Set in a once derelict dry dock in the Brooklyn Navy Yard, Float Farm is a greenmarket powered by an algae roof and housed on a barge. The barge contains a small fishery, a garden, and a bioreactor to create a self-sufficient and environmentally sustainable structure. This marine research station is built with a coral-like skin and is used to develop habitation strategies for coastal cities facing rising sea levels. 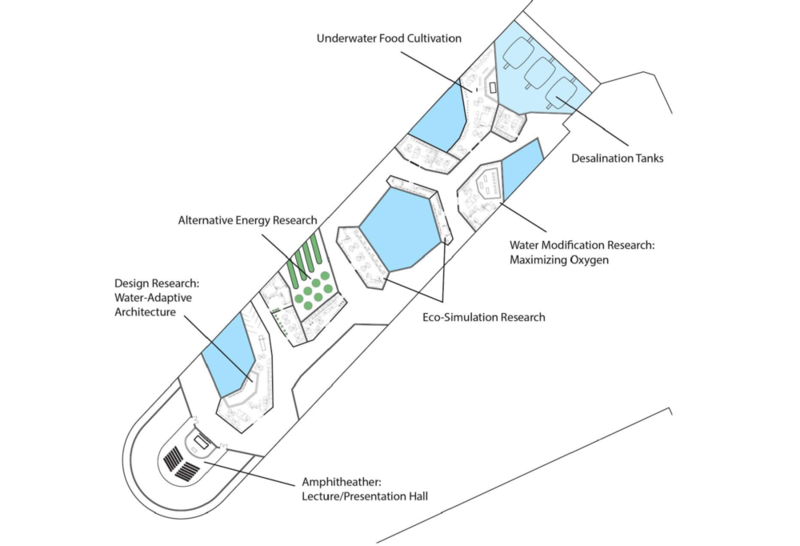 The building is split between research facilities for underwater architecture, energy production, and food cultivation and a museum of aquatic living for the public. 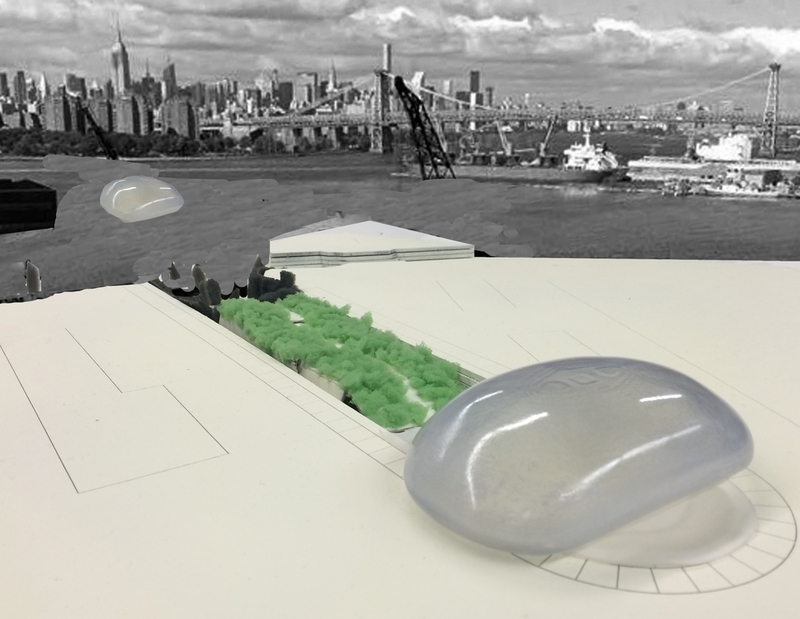 A lab set on a rail above an artificial intertidal ecosystem, the students envision developing a system of soft boundaries between urban areas and the ocean to mitigate urban flooding while simultaneously developing a new coastal economy where these areas could be harvested for oysters and edible seaweeds. Water Dock is a living art installment devoted to tiny marine life like cyanobacteria, dinoflagellates, and plankton and the threat of water pollution imperiling the ocean. Viewers walk through an underwater gallery surrounded by tanks of both these organisms and the pollutants. A living skin of algal capsules power this proposed building. The algae is pumped and siphoned into a bioprocessor at the building’s base and then refined into fuel. Mitchell Joachim is a leading figure in ecological design, architecture, and urbanism. He is the founding co-president of Terreform ONE, a nonprofit organization for philanthropic architecture, urban, ecological design, and is a partner at Planetary ONE, a cross-disciplinary partnership of designers and scientists. Terreform ONE was an official selection of the 14th International Architecture Exhibition and was included in the 2014 Venice Architecture Biennale. Before coming to NYU, Professor Joachim was an architect at Gehry Partners and Pei Cobb Freed, served as the Frank Gehry Chair at the University of Toronto, and taught at Pratt, Columbia, Syracuse, the University of Washington, and Parsons School of Design. A TED Senior Fellow, Professor Joachim has been awarded fellowships with Moshe Safdie and Martin Society for Sustainability at MIT. His ecological home design Fab Tree Hab has been exhibited at MoMA and widely published. Professor Joachim and Nina Tandon’s book, Super Cells: Building with Biology, was published by TED Books in 2014. Professor Joachim, along with Peter Anker and Louise Harpman, published Global Design: Elsewhere Envisioned (Prestel 2014), a showcase of design research as it relates to visionary architecture, landscape architecture, urbanism, and ecological planning. His work can be found at http://www.terreform.org/.